I’m in total Sunday brunch mode. Every week, I scour Yelp, looking for high-rated places (not that Yelp reviews really mean anything, as you know). One of my coworkers recommended two places to me that I’ll keep in mind for future Sundays: Robert and Cafe Gitane. But this week, I decided we should try Corner Shop Cafe. I didn’t really look at what people said about Corner Shop Cafe on Yelp. I just saw that it received about four stars overall. That was enough to get me to look at their website. And, after reviewing their delicious-sounding menu, I thought it would be a nice place to spend Sunday morning. I was right. Located down on Broadway and Bleecker, Corner Shop Cafe is, well, on the corner. Lots of natural light bathes the interior. And cute wooden tables and seats line the walls. Beautiful curtains drape over the centers of windows and the waitstaff are all dressed in black T-shirts with “Corner Shop Cafe” emblazoned on the backs. 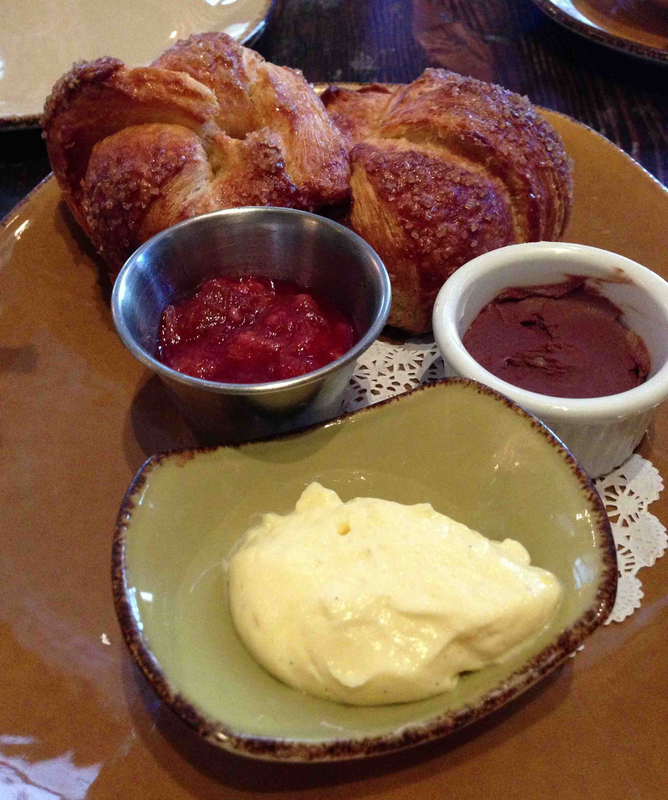 To start, we ordered off the specials/extras menu: mini croissants with lemon chantilly, strawberry preserves and chocolate-almond paste. The croissants were delicate and covered with sugar crystals–a light, sweet take on the traditional croissant. I enjoyed each of the spreads, but I declared to MDP that I could have eaten the chocolate-almond paste on its own. It was like a Nutella, but much better. I opted for the bagel sandwich as my brunch entree: an everything bagel toasted with fried eggs, andouille sausage, stone-ground cheddar grits and cheese. Recently, I told my coworker from Australia that the everything bagel is the quintessential New York food. It’s diverse, it’s egalitarian–it’s everything New York strives to be. And here it was, sitting on my plate, with such wondrous treats stacked on top. When I read the (poorly designed) menu, I assumed the grits would be on the side because who would put grits on a sandwich? Well, Corner Shop Cafe would. And I’m glad they did. The grits were perfectly cooked and the spicy andouille sausage added a certain kick to the sandwich. The sandwich was accompanied by some flavorless home fries (which were chopped potatoes, barely seasoned) and a mixed greens salad with a kind of citrusy vinaigrette on top. Though the home fries weren’t stellar, the sandwich was mighty fine (though hard to eat!). MDP got the chive biscuit with eggs, bacon and home fries. There was some (expected) confusion about what the deal was with the biscuits. The menu is surprisingly poorly written and may have, in MDP’s words, “been created by someone who was illiterate.” Though the ordering process was arduous, the resulting entree that he received was very good. He enjoyed his chive biscuit, the eggs, the bacon and home fries very much. I recommend Corner Shop Cafe for brunch. I saw someone get the pancakes, which looked fantastic. And the breakfast burrito looked delightful, as well. If you steer clear of the biscuits section of the menu, ordering will be nice and easy. All in all, Corner Shop Cafe offers some delicious cooking reminiscent of home. 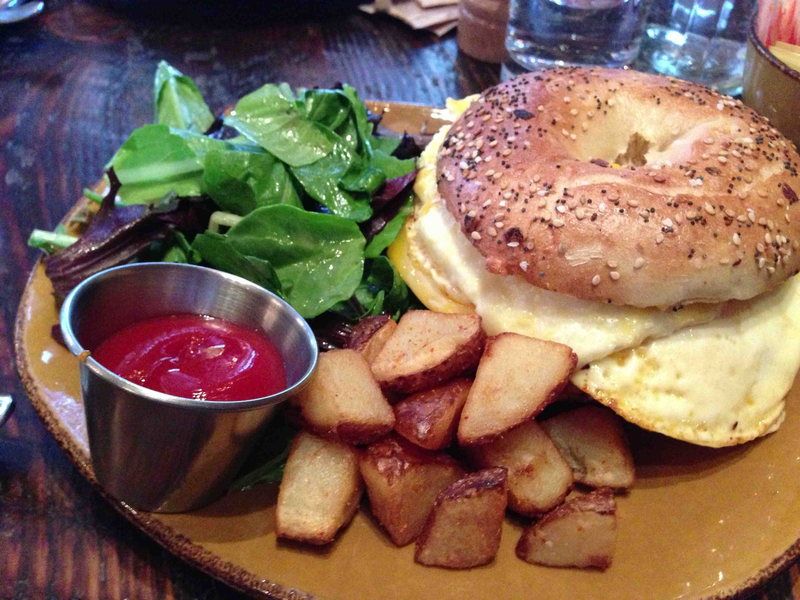 Try their brunch next weekend–and arrive early, before all the hungover NYU kids crowd the place. Take the B/D/F/M/6 to Broadway-Lafayette. Walk up Broadway to Bleecker Street.